Climbing is a bit of a mysterious sport. There’s a lot of terminology to take in and lore to learn when you’re first starting out. If you keep confusing your jams with your pro and your bombers with your whippers, well it’s time to clear some of that up. Today, we’ll be speaking specifically about trad climbing. 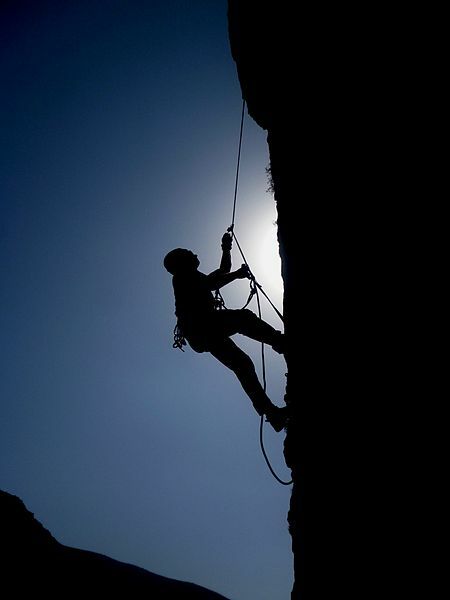 That’s short for traditional climbing, and it was among the first forms of climbing ever practiced. You’re definitely not there yet, or you’d already know what I’m talking about, but learning the basics will help to clear up a lot of questions you may have. Before we start learning about what trad climbing is and where it came from though, we’ve got to get one thing straight. This is not a how-to guide, and just because you’ve read it does not mean you’re ready to go risk your life to your gear. Every time you place a piece of gear on a climb, you are taking your own life into your hands. Experience and skilled mentors are the only real way to learn to trad climb. So what this guide will not do is teach you how it’s done, make you a trad climber, or make your placements more ‘bomber’. There’s a lot to learn when you’re starting to climb. Ok, I’m kidding about trad being cooler. It’s an age-old feud actually, trad vs. sport. Back in the late seventies and eighties, sport climbing was new. Up until then, all the climbing that had been done was done on gear. That’s trad climbing. When you place your own gear in the rock to protect yourself as you go. First, that meant hammering pitons into cracks. As gear evolved, it turned into hexes and nuts that could be placed and removed. Eventually, cams were invented, and modern trad climbing was born. But we’ll cover that later. 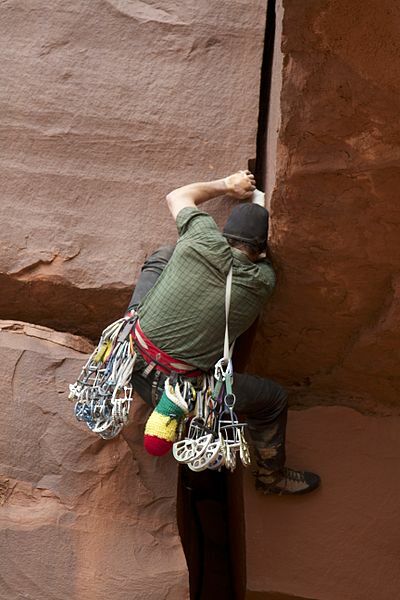 Trad climbers spend a lot of time wedged into cracks, slots, and chimneys. Right from the start though, it was contentious to put bolts in the rock. A lot of the best climbers in America were very adamant about the ethic of climbing. No bolts should be placed unless absolutely necessary. Any climb that can’t be completed of your own power isn’t worth climbing. That meant that climbers were pretty much exclusively climbing cracks. The eighties saw a renaissance of bolting though, and sport climbing was born. Suddenly, people were climbing steeper, blanker faces than ever before. If you’re starting climbing today, you probably have no sense of this old vendetta other than what you saw in Valley Uprising. But that gives you the idea pretty well. You’ll have to decide where you stand on this age-old ethical debate for yourself. Personally, I don’t think there’s any room in the new millennium for old vendettas, purists, and animosity over how someone chooses to climb. Just have fun and be safe. So the first thing you should know about is all the different types of gear you’re going to encounter in the world of trad climbing. It’s not just quickdraws and rope anymore. Now you’re in charge of connecting your rope to the rock, and there are a number of ways to do that. Time to move off the bolts and start placing your own gear. Basically, all trad gear falls into one of two categories; passive or active pro. ‘Pro’ is short for ‘protection’ by the way. So passive pro is any gear that rests in place and does its job by virtue of its shape alone. Essentially, passive pro is a nut, or any type of object you can wedge into a constriction in a crack where it’s shape will hold it in place. Active pro is any gear that changes size or shape when it’s placed and expands within the crack. Cams (originally known as friends) are the ultimate active pro. However, hexes are also considered by many to be active pro because they work by ‘expanding’ into the crack in a sense. We’ll go over it all in more detail right now. Hexes first. 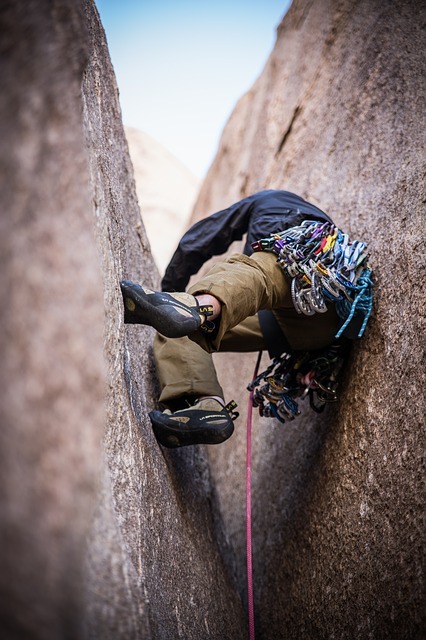 The hexentric nut, or hex, revolutionized rock climbing when Yvon Chouinard started producing them in the mid 70’s. It was the first piece of pro that climbers could use which wouldn’t damage the crack. Piton scars are common on old climbs and forever change the way a crack looks and climbs. It’s bad news and pitons are really not acceptable pro anymore except for experienced aid climbers in specific situations. You’re not likely to use one. Hexes on the other hand are a somewhat dated type of gear that you should learn to use. Having at least a basic set will make your rack, and your skill set a lot more diverse. This is what the average set of nuts looks like these days. In the center is a nut tool to help you get them out of the crack again after use. Nuts are just wedge-shaped blocks of metal that you slide down into a constriction in a crack. If you pull them back upwards, they come back out. Fortunately, you only fall down, not up. However, that should make it pretty clear why it’s so important you know how to place this gear correctly. I’ve seen nuts come out of the crack just from the rope pulling against them as the climber climbs above them. That’s really the worst case scenario. Suddenly the pro you placed is just extra weight on your rope. Not to mention you could be looking at a pretty big or entirely unprotected fall. Tricams are far less common than nuts, and even hexes. Although both hexes and tricams are extremely useful pieces of pro, they are often only used by experienced veterans who remember the days of solid stem cams and belaying before the Grigri. A tricam is also a semi-active type of pro that slots into a crack on its narrow side. If you fall on it, the force pulls on its wide axis and it cams into the crack (by ‘cams’ I mean that it expands). Tricams are especially useful for horizontal cracks and pockets where cams won’t work. Cams are the new gold standard in trad climbing. They are the bread and butter of betting your life on a piece of pro. If I had to take a forty foot fall, I’d want it to be on a cam. Preferably a big one. That’s because a well-placed cam is by far the most reliable and strongest form of protection climbers use today. When properly placed, a cam is often stronger than a bolt, believe it or not. A properly placed cam. One this big could catch a car or two. Cams were invented in the early seventies but not patented until ‘78 by Ray Jardine. These first cams were known as ‘Friends’ and had a solid metal stem. They still work the same as they did back then though. You pull back on the handle to load the cam. It shrinks while you place it into the crack and then release the handle and it expands to fit the crack. The curve on the outside of the lobes is actually a logarithmic spiral (the golden ratio) which allows them to have a constant angle of force on the crack, no matter how they’re placed. See, math really does matter! These days, Black Diamond cams are by far the most common brand followed closely by Metolius. BD’s are called camalot C4s (if they’re the newer models) and are numbered and color coordinated. 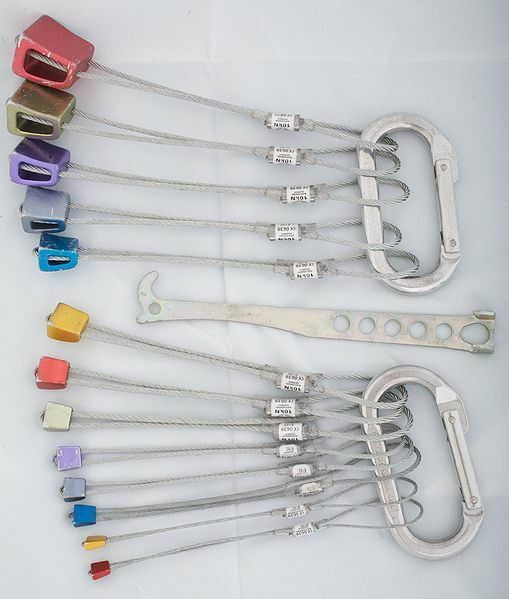 Metolius brand cams are called Master Cams, Power Cams or TCUs and are color coordinated to a different scale than BD. It may seam annoying, but each brand actually makes different sizes. So a BD 0.75 is green which is almost the same as a Metolius red, but a little bit smaller. 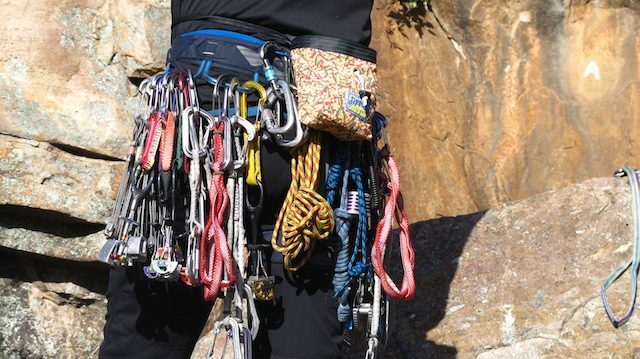 Trad climbers all eventually choose a favorite brand. Personally, I like Black Diamond for bigger cams, but Metolius for anything smaller than 0.5 (BD). That’s because the way Metolius cams are designed makes a more secure small unit than Black Diamond in my opinion. Even though it’s different than trad climbing and would require at least one other article to describe accurately, we should at least cover aid climbing. If you’re getting into trad climbing, you’re bound to start hearing some aid climbing terms, and they’re going to throw you off. So let’s cover the basics at least. That way, you don’t think you’re supposed to know how to use hooks and don’t get concerned when you see a route graded C-2. 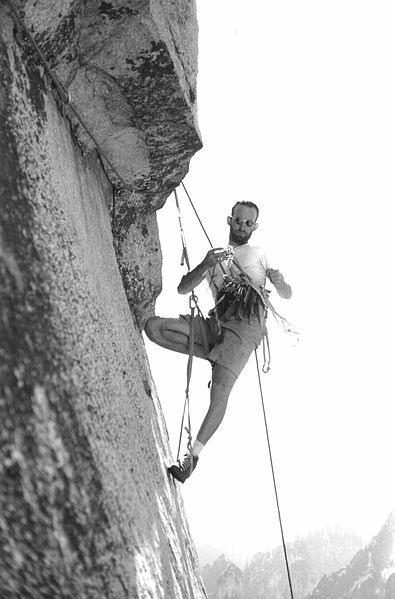 A classic shot of Royal Robbin, the king of Yosemite, aid climbing. So aid climbing is the actual original form of climbing. You ascend cracks by placing gear, hooking yourself to the gear and pulling yourself up on it. You seldom, or never use the actual rock to climb. That is what is known as free climbing, and it was ‘invented’ in Yosemite (as far as the US goes) in the seventies. Aid climbs are graded with A ratings, meaning ‘aid’. You’ll also see ratings like C-1 or C-2 which stands for ‘clean’. Basically, C-1 is really easy, and you can get up it using a couple of quickdraws. Buy I’ll leave that research to you if you’re interested. Although we aren’t going to focus on it today, aid climbing is an important skill for anyone that wants to be a well-rounded climber. It will help you get out of lots of tight spots in the mountains. And most importantly, it will teach you to have a new understanding of how your gear works, and what it’s limitations are. 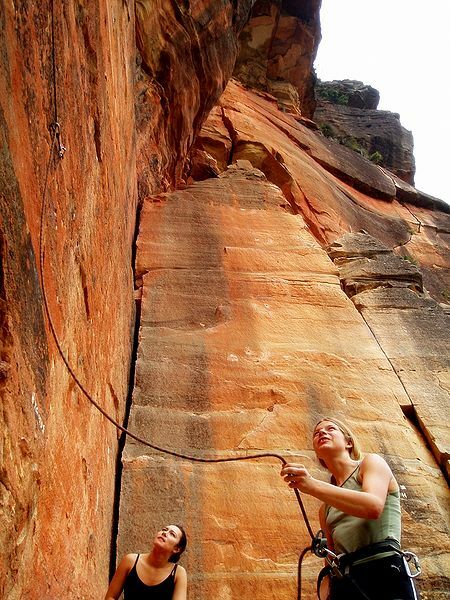 When you’re trad climbing, you’ll be following systems of cracks to the summit 99% of the time. That’s because if you don’t have a crack, you can’t place gear. Fortunately, rock tends to have cracks. 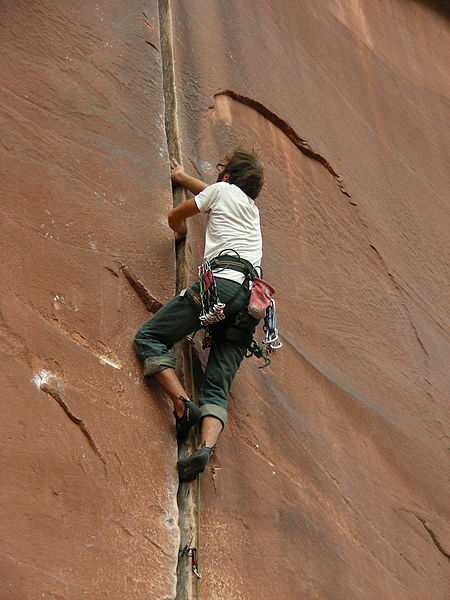 Especially the harder types of rock that climbers like best, such as granite. So that means you’re going to need some special climbing techniques to climb these things. 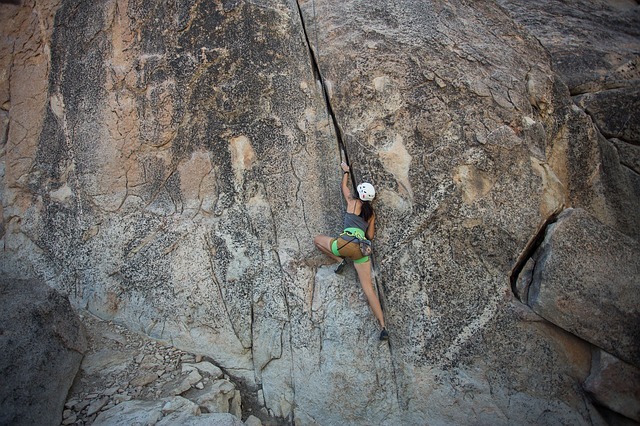 Climbing cracks is all about wedging yourself in and working the angles. When you step up to your first crack climb, it’s likely to be a bloody struggle. You’ll pull on the sides of the crack, try to pry the thing apart, push in all directions, and wind up right back where you started. You’ll search around for any face holds you can find to make it feel more like a sport climb. 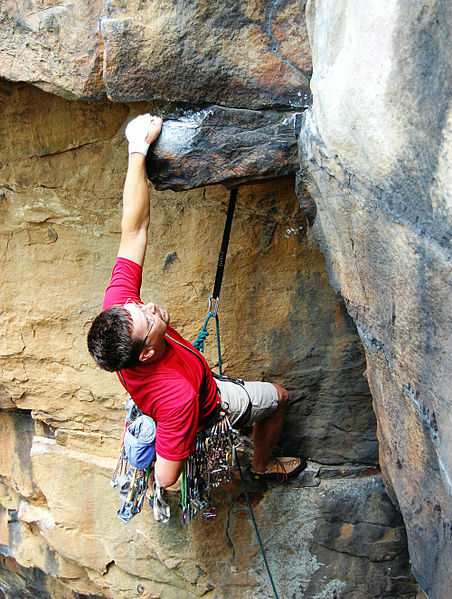 Likely, you’ll climb a 5.6 crack using holds that make it feel like a 5.10 climb. That’s just how it goes. Learning how to climb cracks is hard. That’s because before you know how to use them, cracks are pretty mysterious. But once you learn how to jam, they’ll be your best friend. Jamming is essentially using your hands, feet, arms, and legs to do what cams do. You stick them in skinny, and then use various techniques to make them get fat. Most commonly you’ll be using your hands and feet. Sometimes it doesn’t matter how good your technique is, climbing crack is just going to be hard. A hand jam comes from sticking your hand in the skinny way, thumb up or down, and then cupping your hand around your thumb. This creates a sort of triangle shape that you can wedge into constrictions in the crack. With your feet, you’ll usually be sticking the toes of your shoes in sideways (so they’re skinny) and then twisting them into the crack so you can stand straight up on them. For narrower cracks, you’ll learn to use just your tips to do finger jams. In wider cracks (off-widths) you’ll use your whole body to do whatever you possibly can, and you’ll certainly bleed. It’s a long learning process, and you only figure it out by trying and probably failing. As you have hopefully already realized, there’s a lot more to trad climbing than just clipping your rope to a bolt. It takes more than climbing skill. It takes safety skill. You need a good mind for the physical challenge as well as an awareness of risk and safety. Not only that, but you need to be making these decisions on the fly and in the moment. It’s not the type of sport you learn fast or mess around with. When you’re trad climbing, each move is unique. Every situation needs to be assessed carefully. 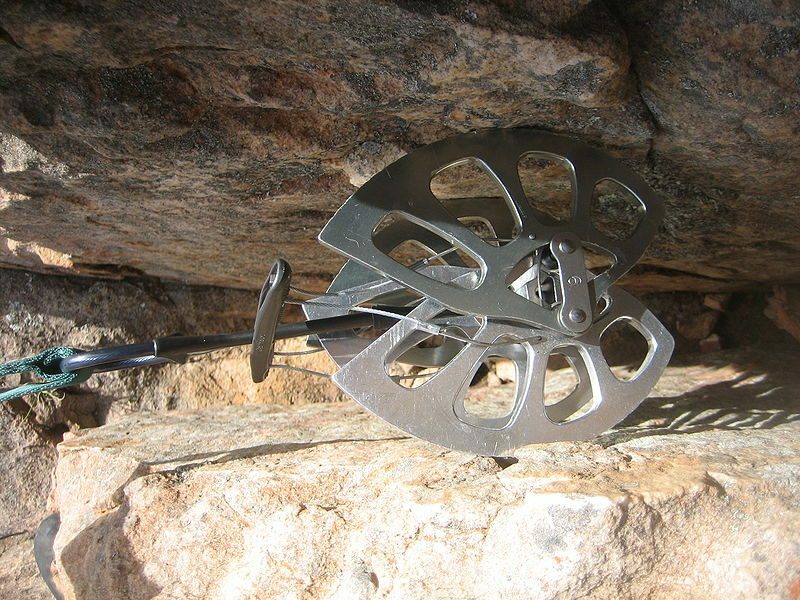 When you start learning to place trad gear, you should be on a climb that is way below your ability level. There should be plenty of places where you can stand with no hands on the rock and fiddle with gear. You should have an experienced trad climber with you to assess your gear placements and tell you if they’re good or not. After all, it’s not the kind of thing you want to test by falling on bad gear. When you’re trad climbing, you should probably have falling on your mind. Climbing’s not the kind of sport where a big set of cojones is enough to make it work. You’ve got to have your head in the game. When you’re learning, you need to think about the size of each fall, the angle your protection should be placed at, as well as the type of protection that will work best. Think everything through and if you encounter questions you don’t know the answers to, look them up or ask someone who knows. Once you’re starting to get the hang of it and know what your gear should and shouldn’t look like, it’s time to start testing it. Whenever someone learns to place gear, it’s usually months or even years before they ever fall on their gear. So basically, they don’t even know if what they ‘know’ works. I recommend placing two or three pieces in the same place. All of them should be bomber (really good) and then climb up a couple of feet, tell your belayer, and just fall. The highest piece should take the whole fall, and it should hold. Falling on your own gear is the last step to becoming a trad climber. At that point, the journey will be your own, although it will never end. 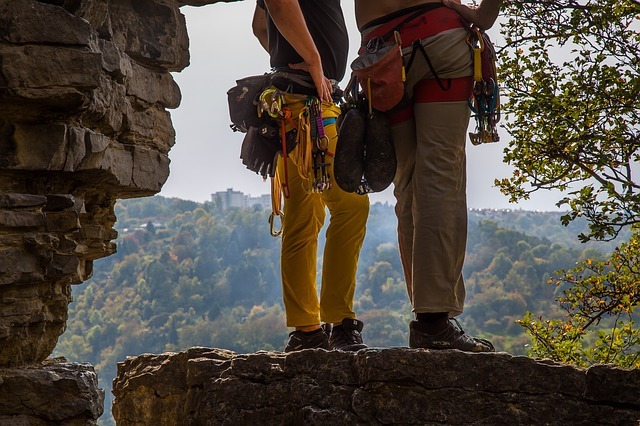 You should make a habit of climbing with other partners who are more experienced than you. That way you’ll learn from them and expand your skills. Always be upfront about what you do and don’t know. There’s no shame in being a beginner, but pretending you know more than you do could be potentially life-threatening. Furthermore, you should pick your partners very carefully. You don’t want to go climbing a mountain with a hot head who thinks they know everything. Most importantly, progress slowly. 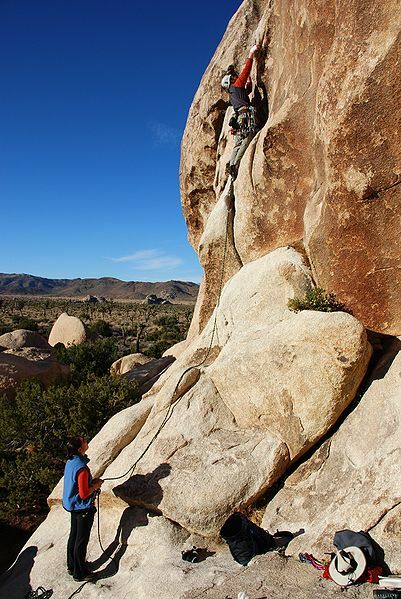 Take your time, and never pass up an opportunity to learn from an experienced climber. Those who have been doing this a long time will have a lot of respect for a beginner who knows what they don’t know and asks for help. The number one no-no is acting like you know more than you do. Stay humble, stay safe, and never stop learning. So if you’re trying to learn to trad climb, you’re going to need to go where the rocks are. You can’t learn to trad climb at your local limestone sport crag. That’s just the way it goes. So let’s go over some of the most famous places to learn to climb trad and what makes them so special. Not all climbing destinations were created equal. First and foremost, we have to talk about Indian Creek. Also known as Bears Ears National Monument, ‘The Creek’ is located about an hour south of Moab, Utah and it is a trad climber’s paradise. That’s because it’s all wingate sandstone, which is a very unique type of rock. It forms smooth, straight cracks, but is harder than normal sandstone, so you don’t have to worry about it breaking. You’ll have to go to understand, but there’s really no better place to learn. The climbing isn’t easy, but you’ll come away from a month in the creek a better crack climber than a lot of people who have been doing it for years. Second, let’s talk about Squamish. It’s technically over the border in BC, Canada, but it’s got to make a list. That’s because Squamish is home to some of the best easy trad climbing on the continent. Hundreds, maybe even thousands of climbs go at 5.8 or below and you can even trad climb 16 pitches to the top of the Chieftan at 5.9 or below the entire way! It’s a marvelous place, no matter what type of climbing you like. But the beginner trad climber will find exactly what they’re looking for in Squamish. 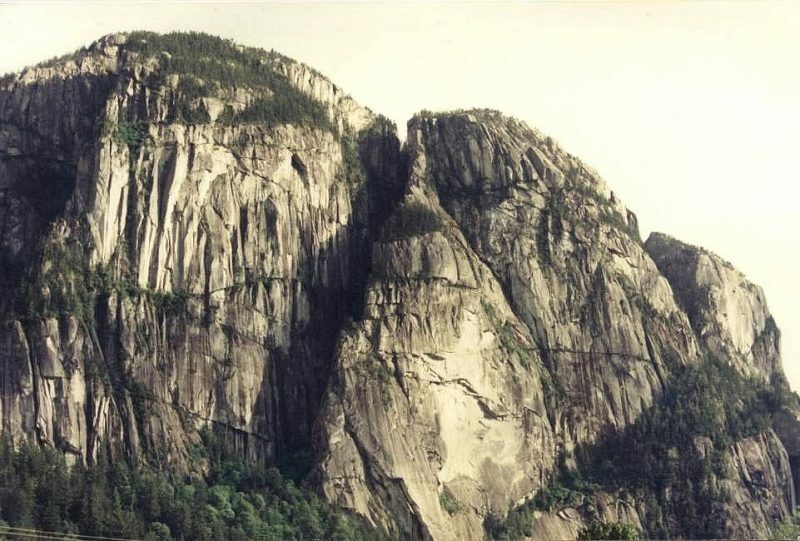 Side view of the Stawamus Chief. One of the biggest and most beautiful pieces of granite on the planet. Yosemite is definitely the most iconic and classic place to trad climb in all of the US, possibly all of the world. With the amount of history wrapped up in this place, it’s an important pilgrimage for anyone who considers themselves a climber. And although it’s famous, it’s certainly not the easiest place to learn to trad climb. However, if you can learn to do it here, just like Indian Creek, you’ll have a leg up on a lot of other climbers. The grades are tough, the rock is slick, and the locals go hard. So how do you start trad climbing? Well, you start by following. Find a friend who climbs trad and convinces them to take you out on gear. Bake them brownies, give them back massages, clean their rope. Whatever it takes. The best way to learn how to trad climb, and undoubtedly the cheapest, is to learn by following another climber on their gear. That way you don’t have to buy all the gear to start learning how to use it. How do you accumulate all this gear and knowledge? You will have to buy your own eventually, but it’s best if you know what you’re looking for before you make that commitment. When you’re ready, there are two ways to go about buying your own trad gear. First, you could buy it all piece by piece and slowly accumulate a rack (a rack is your complete set of gear). However, then you risk going out without enough gear, and you wind up spending a lot of money on gear that will just sit around until you have enough to get going. You’re also likely to wind up paying more per piece this way. The way I suggest you get your first rack of gear is all at once from another climber. If you’re a member of your local Facebook climbing group and keep your eyes on craigslist, you’re sure to see a rack pop up from time to time. If you swoop up an entire used rack at once, not only will you get a better deal, but you’ll also wind up with enough gear to go climbing right from the start. This way you don’t wind up halfway through your rack and losing interest because you never actually go climbing. Get out there and get after it. Whatever you do, get out there and go climbing. 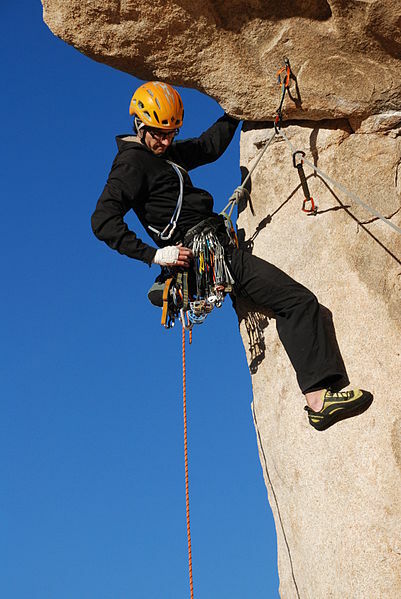 Find ways to learn from experienced climbers and take safety seriously. Don’t rush into situations you aren’t comfortable with and don’t say yes to ideas you don’t feel good about. Stay humble, work hard, and soon you’ll be the one teaching a young kid how to place gear correctly.